I don’t think I “get” Quentin Tarantino. I mean, I like his movies fine, I guess, but I don’t understand what the big fuss is all about. I find it fascinating how he treats all of cinematic history as one big scrapbook and how all his films are essentially collages and pastiches, but I don’t really understand why I should care. I guess what I’m saying is, while I appreciate him artistically, I have never been emotionally moved by a Tarantino film. Ever. Not once. 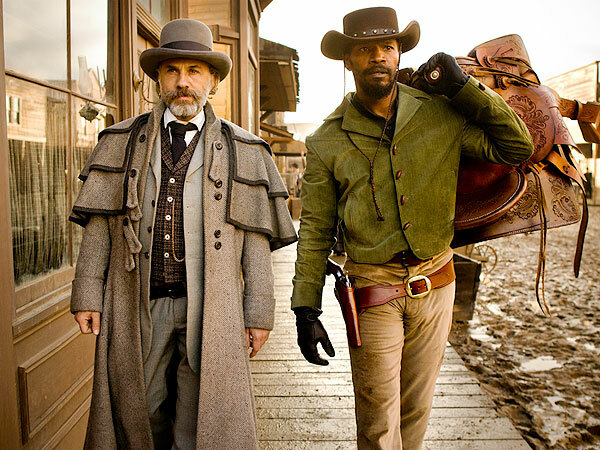 Django Unchained (the d is silent) is a Blaxploitation-esque revisionist history of the Civil War. Sort of. Not the whole Civil War, just a corner of it. The film follows Django (Jamie Foxx) a beatdown slave who teams up with an intriguingly German bounty hunter (Christoph Waltz, elevating the material as usual), to track down evil slaveowners and to try to find his wife, Brümhilde (Kerry Washington). Lots of classic Tarantino gore and meditations on violence and revenge and all that crap. Decontextualized music and narrative. So. Much. Gore. The real problem I had with it, though, was that it didn’t actually feel at all new to me. It really felt like Inglourious Basterds Part 2: Slavery Edition. Which is fine, I guess, since that movie was pretty good and did get a lot of critical attention and stuff. Also Christoph Waltz was in it so yay. I just…I just don’t get it. It’s no fault of the actors, who are doing their absolute best here (seriously, everyone involved is acting their butts off, especially a really creepy Samuel L. Jackson), but I had a lot of trouble emotionally investing in the story. At its core, this is a movie about a man and a woman trying desperately to get back to each other. I like that. I find that resonant. Unfortunately, I spent so much of the film being distracted by Tarantino’s flourishes and quirks that it was hard to let the emotional story sink in. Maybe it’s too much to ask him to play it straight, but what I really wanted was just that. A straight up story about love and quests and devotion and how far we’re really willing to go. When I really get down to it, though, what I find unnerving about Tarantino’s work, aside from my general distaste for his style, is his attitude. I get that he likes making movies about tough subjects. I think that’s great. Really. Later on I’m going to review Zero Dark Thirty, which is a movie comprised of nothing but tough subjects, and I will praise it for its unflinchingness. Look, I’m all for movies that confront unpleasant parts of our history and force us to stare unremittingly into the abyss of our own crappiness or whatever, and I would give a kidney to see a well executed film made about the Massacre at Wounded Knee or the Japanese Internment camps in WWII or other stuff. But there’s a difference between making a movie about difficult periods in our nation’s history and suggesting that we can do better and we should do better and isn’t this what we were striving for let’s go for it, and making a movie that says everything’s fucked up and it’s always going to be fucked up. It really comes down to usefulness. 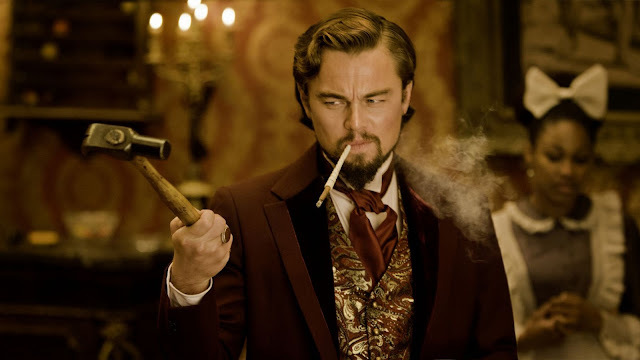 In my mind, there are a few ways that a movie like Django Unchained is useful to a viewing audience. On the one hand, its overstated violence and intensity allow viewers to emotionally experience the horrors of a brutal time in US history. On the other hand, by making an absurdist revenge fantasy, Tarantino prevents the gain of any real historical context or understanding. It’s nice to say, “Maybe if black people had some guns back then slavery would have ended sooner,” but that’s reductionist and frankly kind of insulting. The institutionalization of slavery was so entrenched that it took five years of all out bloody war to end it. It’s a nice idea, but no. And really that’s what most of Tarantino’s fantasies come down to. They’re nice ideas, like Jews being able bring down Hitler and the Third Reich by carving swastikas on foreheads, but they neither aid nor progress the understanding of our history. They just wallow. Okay, now that I’ve totally harshed everyone’s mellow, let me say some good things about this movie. As stated above, the performances really are excellent. Yes, Leonardo DiCaprio is fabulous as an evil slaveowner, but the real standout is actually Mr. Jackson, whose Uncle Tomming house slave is genuinely terrifying and actually pretty unrecognizable. Best acting I’ve seen from him in years. Christoph Waltz makes me happy, Walter Goggins from Justified is playing pretty much the same role, and Jamie Foxx does a really stupendous job as the titular Django. He deserves his nomination. Kerry Washington does a good job as Brümhilde, but unfortunately for her, there’s really not a lot of material there. 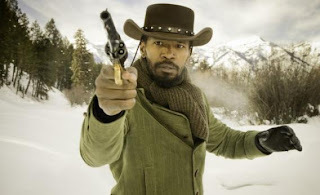 Her character functions more as a pot of gold to keep the story moving, and we get to see almost nothing of her as a person and outside of Django’s interpretation of her. Again, problematic, since a lot of her storyline focuses on the way that control has been wrenched away from her in the horror of slavery, but we can see that control is never actually returned to her. She never gains agency, and she never is allowed to speak for herself. Blech. The film does draw an interesting parallel in the comparison of bounty hunting, a flesh for cash business, and slavery, but tragically it does almost nothing with it thematically. It has the opportunity for real resonance and a larger point, but mostly wastes it on gunfighting montages. So, basic Tarantino. Really, my analysis of this movie comes down to one basic principle: Dear Quentin Tarantino, please start making movies again and not collages. I know you’re talented, now shut up and tell me a story. And stop wallowing in the misery of our history. Do something about it. And can someone give Leo an Oscar already? He's getting tetchy.